When our tour bus entered Bethlehem it was the first time we saw “the Wall” (a.k.a. “security perimeter”) from the Palestinian side. The Israeli side of the Wall is clean, unmarked. The Palestinian side is a seemingly endless mural of “prison art.” I was too slow getting out the camera and missed taking photos of some of the more striking images: a weeping Statue of Liberty, holding a dead child (after Michelangelo’s Pieta); the desolate stumps of a clear cut forest; Alice about to step through an intriguing little door. 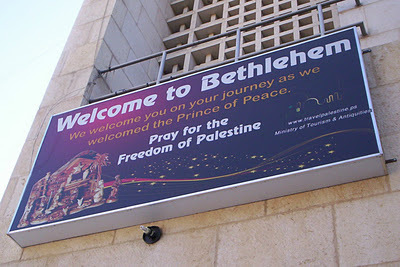 Bethlehem was in occupied territory at the time of Jesus’ birth, as well. Mary and Joseph were compelled to leave their home by order of the ruling powers, and after arriving in Bethlehem, forced to flee again in terror of violent government oppression. Today the Palestinian people, who were also compelled to flee their homes by an occupying military regime, still find their movements through the country controlled and curtailed by the Israeli government. Our Palestinian guide was frequently tearful, describing what it’s like to live under foreign military rule. She told us of the humiliation and frustration she felt every time she had to pass through a security check point: an ordinary, unarmed woman routinely treated as a suspected terrorist. I can’t imagine what that must be like, as someone who’s never lived in “occupied territory” … or have I? The Gospels of Matthew and Luke may emphasize the Roman occupation, but John highlights the spiritual occupation: that Jesus came into this world to overthrow its invisible, intangible ruler, the Prince of Darkness. The question of whether Satan is a person, a principle, a force, etc. could be the subject of a separate post. That’s not important here. It is clear that we are living under the occupation of the powers of greed and reckless opportunism, exclusion and vanity, selfishness and deliberate ignorance–the powers of darkness and evil. And the birth of Jesus was the beginning of a resistance movement, called the Kingdom of God. There’s this old comedy starring Danny Kaye, The Court Jester–it’s always been a favorite of my family. I think it must be spoofing the Scarlet Pimpernel or something, but part of the plot is that there is a false king on the throne, and the rebels who live in the woods are fighting to protect the true heir to the crown, still just a small infant. The movie pokes fun at the idea that a tiny baby could be considered “the king.” But that’s just what we say about Jesus at Christmastime. The work of salvation began not on the cross but in Mary’s womb. Why? Because the Resistance is not about fighting with swords or machine guns or missiles–because the Almighty who strips completely, surrendering all power and authority to become a helpless, naked, and hungry infant is the true king and savior of this world. Because peace will not be purchased through war but will come to us only by the power of the vulnerable God, the weak God, the God of love. At the Church of the Nativity in Bethlehem, where they say Jesus was born, the welcoming signs asks visitors to “Pray for the Freedom of Palestine.” Please do. Please pray for the freedom of Palestine, and for the freedom of the world. This entry was posted on Saturday, December 24th, 2011 at 8:48 am and is filed under christmas, Reflections. You can follow any responses to this entry through the RSS 2.0 feed. You can leave a response, or trackback from your own site.